The first flavors I pick up are a salty seasoning blend of black pepper, garlic, onion, and coriander seed. The chewing brings on more seasoning complexity, with touches of the tomato sauce, and faint notes of raisin. 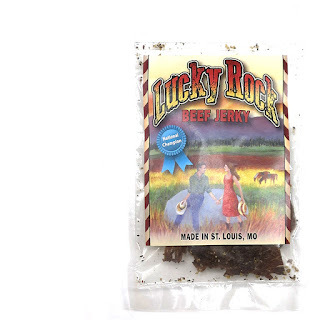 What strikes me immediately with Lucky Rock Beef Jerky is a bold, strong flavor that hits right away, mostly through the seasoning blend. The saltiness feels high, even though the sodium content on the nutrition label shows 230mg per ounce, relatively low compared to major brands. 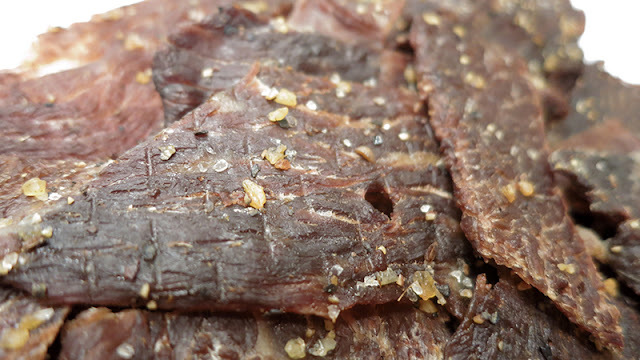 Otherwise, the primary taste profile is that of a salty seasoning blend, of garlic, onion, black pepper, and coriander seed, but backed up with a marinade of light soy sauce, touches of tomato, and hints of raisin. There's even a light bit of spiciness, which feels hotter than it really is due to the strong saltiness. The meat consistency seems good overall. It's thin sliced slabs, and well marbled, with a dry feel and touch. They're still flexible, however, and generate a fair amount of chewiness. They chew quite meaty, but not exactly to the point of a steak. It tends to remain chewy. Lucky Rock Beef Jerky awakens the taste buds with a bold seasoning blend much like a Montreal steak. I like the coriander seed flavor, and I really like the unique marinade with its subtle tomato and raisin overtones. Even the meat consistency and chewing texture is good. It's the higher saltiness that wears me out, even though the Nutrition Facts label indicates a lower sodium content. 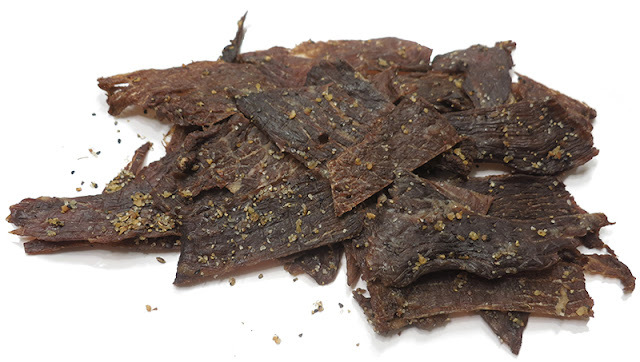 But knowing there's a lot of folks who crave that salty seasoning flavor, they'll want to try Lucky Rock's unique blend of spices contrasted against its also-unique marinade.